◊ Girls Clothing Auction shop for your princess. ◊ Boys Clothing Auctions shop for your prince. Below are a few clothing auction categories that may be of interest to you. Great place to find deals when shopping for your kids. Have you tried the Kids clothing store directory here at Apparel Search.. If not, you do not know what you are missing. As a matter of fact, you can search for additional children's clothing retailers at the Apparel Retailer site. Here are a few more categories of possible interest if you plan to do some shopping today. 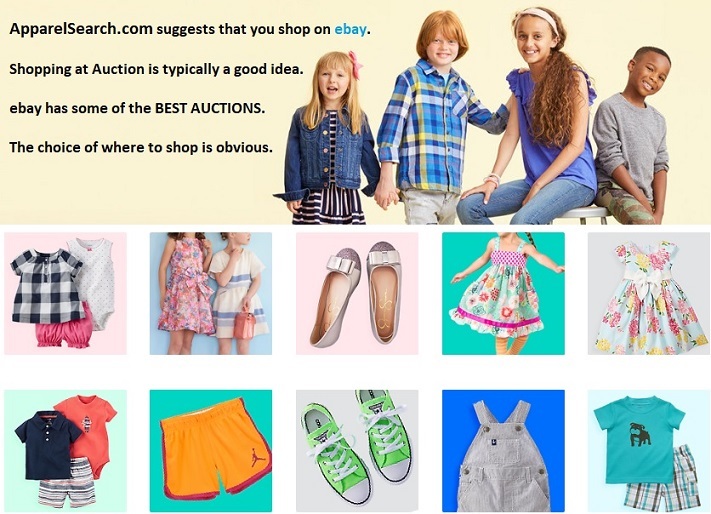 eBay is one of the most popular internet fashion sites for purchasing children's clothing. A great resource for fashionable, designer clothing, shoes and accessories. Kids with various interests and style will find a great assortment of clothing options on eBay. Find shorts, t-shirts, jeans, shoes, belts, and just about every other type of fashion imaginable. You may wish to learn more about current style trends for kids by reading Children's Fashion News. Have you ever shopped for clothing at Auction? If not, you do not know what you are missing... It is sort of fun at times.. Anyway, if you have interest in shopping at auction is a nice shopping alternative. Certainly, we think that shopping at a fashion boutique in New York, Los Angeles, or Milan may be a better way to go, but using the internet as an occasional method is not too bad.